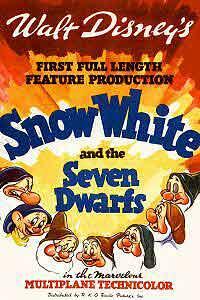 Ridiculed as "Disney's Folly" when Walt Disney first proposed the idea, Snow White and the Seven Dwarves confounded the critics and naysayers by achieving amazing success. This movie was the first full-length animated motion picture ever released, and it has become one of the best-loved family movies in the nearly 70 years since its 1937 release. "Magic Mirror on the wall, who is the fairest one of all?" The Queen is accustomed to reigning supreme, and her vanity knows no bounds. When the mirror does not give the expected answer but tells her of a girl far more lovely than she is, the Queen is incensed and begins to plot against the princess Snow White. 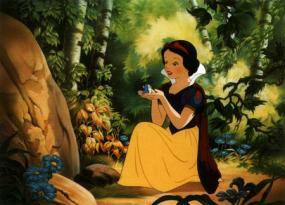 Snow White, meanwhile, is going about her chores at the castle and singing to the birds. While getting water from the well, she sings to the echoing wishing well. Her beautiful voice attracts the attention of a passing Prince, who climbs the castle wall and joins her in the last strains of "I'm Wishing." Startled and frightened, the modest Snow White runs into the castle and locks the door. Meanwhile, the Queen has called her loyal huntsman and instructed him to take the Princess to the woods to pick wildflowers. He is to kill the girl and bring back her heart in a box. The reluctant huntsman acquiesces, but when he gets to the woods with the Princess, he simply cannot do the evil deed. He tells the princess to run far away because the Queen wants her dead. Snow White flees in terror, stopping only when she collapses in fatigue and fear. The woodland creatures come to comfort Snow White, and they succeed in cheering her. But then she realizes she has no place to stay. The creatures lead her to a little cottage, which she finds in an appallingly filthy state. She sets about cleaning it, and, with the help of the little animals, they get the house clean and neat. When they go upstairs, Snow White finds seven little beds with names carved on them. Suddenly tired, she falls asleep. The dwarves are at their mine, working hard. When they return home, they are stunned to find the lights on, supper on the fire, and the house sparkling clean. They are even more startled to find a girl asleep on their beds. Snow White tells them who she is, and she rightly guesses which dwarf matches each name on the beds: Doc, Bashful, Sleepy, Sneezy, Happy, Dopey, and Grumpy. Grumpy is certain that having the Princess there is dangerous, especially if the Queen wants her dead. But the others are entranced by the sweetness of the girl and agree that she shall stay. Snow White stays with the dwarves, cleaning and cooking for them, and living happily away from the jealous eye of her wicked stepmother. They laugh, play, and sing together, and Snow White tells them of her love for the Prince in "Someday My Prince Will Come." The dwarves are pleased to have her with them for as long as she wants to stay -- her sweetness is melting even Grumpy's stony heart. When they return to work, they caution her against strangers, for they know the old Queen is crafty and dangerous. Meanwhile, the Queen has received the box from the huntsman, and she goes to her mirror. The mirror tells her Snow White is still alive, and the heart in the box is that of a pig. The wicked Queen goes down to her witch's lair and concocts a potion to transform herself into an old crone and then prepares a poisoned apple to destroy the Princess. When she reads that the only antidote to the poison is love's first kiss, she is certain she is safe, and she will once again be the reigning beauty in the land. The old crone comes to the dwarves' cottage, posing as an old peddler woman selling apples. The old woman finds Snow White making gooseberry pie and tells her men love apple pies. She tricks Snow White into tasting the poisoned apple, and Snow White falls dead at her feet. The woodland animals have seen everything, and they run frantically for the dwarves -- dragging them from their work toward the cottage where the Princess lies. When the dwarves arrive at the cottage, they see the old crone running away and give chase. But she falls from a cliff while trying to kill the dwarves and is destroyed. When they return to the cottage, the dwarves are devastated to find the body of the lovely girl. She is so beautiful that they cannot bear to bury her in the ground, so they place her in a gold and glass coffin and make a shrine for her in the woods. The Prince, who has been searching for his love, hears of the beautiful sleeping girl and visits her shrine. When he realizes that it is the girl he has been seeking, he is overwhelmed with grief and bends to kiss her before sinking to his knees beside her bier. His kiss breaks the spell of the sleeping death, and all is well once again ... Snow White and her charming Prince live happily ever after. Highest grossing film of its time, earning than $8 million in its first release ... quite an achievement in an era when a child's ticket cost 20 cents. It held this position until the release of Gone With The Wind. First of the Disney Movies to hold its premiere at Radio City Music Hall. Received one special honorary Oscar and seven smaller special Oscars in 1939 in recognition of the groundbreaking nature of the film. Nominated for an Academy Award for Best Musical Score in 1938. Received numerous other awards since its release.